If you are wondering just how well your own Internet connection stacks up against others, the question is actually pretty easy to answer if you live in the United States: your connection is likely small broadband. It is also probably slower and more expensive than you will need very soon. This Google chart shows where the U.S. ranks in upload speeds among a few countries, and it’s not very pretty. High-quality broadband services are a key infrastructure piece for this information-focused century. If creating and sharing information defines our jobs, we need to be able to upload it faster than most of us can today. When Congress passed the Telecommunications Act of 1996, the conference report discussed the goal of opening the door to competition. The hope was that the private sector would improve all sorts of communications and get us on the road to the future. There have been some benefits; certainly getting my telephone service from either the cable or phone company has driven down the cost of my phone service. However, my triple-play bundle, which includes phone service, is up to $165 monthly. For that cost, my wife and I enjoy lots HD television channels we hardly watch, some Netflix shows, inexpensive long distance calls, even to Canada and enough bandwidth to do basic video conferencing and computer work that accommodates my home office work. But the promised competition has not applied to broadband speeds: while many Americans got access to this kind of small broadband, there is no magic technology will make Internet speeds significantly better in the foreseeable future. On top of that, the U.S. government estimates that demands on broadband will increase by an astronomical number in the next three years, as more and more people figure out how to use it. Already I notice the difference in my Internet access on weekdays when the older kids are home. While we do not have snow days like this chart, the bad-storm effect is similar and it makes working from home harder. As more and more tablets and smartphones are used at home, the demands will increase on our networks built with yesterday’s technologies. More importantly, no one is really competing for my Internet business. I either take what the cable company offers me or suffer the indignity of using DSL or satellite. Phone company technologies have dropped far behind cable company technology. VDSL, the phone companies’ next-generation technology, offers faint hope only for the subdivisions built within the last ten years or so, because VDSL requires fairly new copper wires. Where Is The Fiber Solution? If you do believe that big, affordable broadband will be a significant engine of growth in this century, the only real solution is fiber to the home (FTTH). The million-dollar question: how are we going to get it and pay for it? Most of us who have modest, small-broadband service today have it because some company makes a lot of money from wires buried a long time ago. There is little business incentive for the people who own the current buried wires to replace them with fiber. It will take time to recoup the cost of burying fiber and running it to our homes. Verizon’s FIOS, which cherry-picked some of the best neighborhoods, has stopped its expansion. Incumbent service providers claim that most Americans already have access to “broadband.” The problem is that the access is to small broadband with almost no chance of an improvement in the near term. So if cable and phone companies think things are hunky dory, what is going to save us? One alternative could be public-private partnerships that delivers an open fiber network upon which vendors compete for customers. Governments can finance the construction costs of fiber with low cost bonds. In return for a negotiated long-term use of the network by public entities, the ownership and management of network is transferred to a private company set up just for this purpose. Modern governments have large communications bills from leasing high speed lines for integrated communications services including fire, police, security, government and schools. Having access to a low cost, high quality infrastructure with fixed costs instead of annually rising costs can make lots of financial sense to municipalities especially if they already own their own utility company. Can Government Handle The Fiber? Along with the successes in pushing fiber to communities, there have been some locations where cities and towns assumed that running a sophisticated network was simple, like running an electric utility selling something that everyone has to have. This has often turned out not to be the case. A phased approach to extend the fiber neighborhood by neighborhood often makes most sense. The service you deliver has to be affordable with competitive offerings. Running a FTTH enterprise with a lean staff has to use all the automation that it can, because taking care of broadband customers is not a nine-to-five job. On top of that, if you want FTTH to be successful, you have to market it. Some of these success factors are not government strengths. Private entities can step in and help navigate the path to success or even provide software to help. The best-run big broadband systems have open networks, where the service providers can jockey for the consumer’s business. Think of it like a road. While the government owns the roads, they do not determine which businesses can use it or what products and services those business can supply. With 135 miles of fiber, Danville, Virginia has made strides at transforming their manufacturing dependent economy. They now have over 500 homes in their initial FTTH deployment. It is doubtful that Danville would be able to lay claim to the first site with a next-generation supercomputer outside of federal laboratory or university without their fiber network. One recent project, Chattanooga’s FTTH, has gotten a lot of publicity recently. Chattanooga’s electric company runs the service andhas also modernized their electric grid to use the Internet to reroute electricity around outages. Google’s fiber projects in Kansas City, Provo, and eventually Austin, Texas have also made the headlines. You do not have to be a city to need better connectivity. The Wired Road Project is a project in rural Southwest Virginia with a mix of fiber and wireless. It is bringing big, affordable broadband to many who have never had it. Fiber to the home is a little like the push of electricity to our rural areas in the 1930s. However incumbents are a lot smarter today. Through aggressive lobbying, they have convinced a number of states to pass bills making it harder for municipalities to become involved in fiber. In North Carolina, Time-Warner and other small-broadband providers successfully lobbied for stringent restrictions on new municipal fiber projects. A couple of municipalities, including Wilson in eastern North Carolina, were grandfathered in but there have been no new municipal FTTH projects in the state since the bill passed. Wilson’s Greenlight Community Broadband has been a huge success for the town and compared favorably to the winner of our speed tests for best broadband, Google Fiber. People and small companies needing true big broadband are moving to Wilson from the Raleigh-Durham area because of Wilson’s fiber network. As someone who lives in North Carolina, I can attest to people moving from the Research Triangle area to Wilson is a huge shift from the status quo. Wilson, with a population of less than 50,000 people runs their own services and a basic triple-play package of phone, cable and a symmetric 20 Mb/s Internet connection is only $99.95 per month. A basic Internet package with a 20 Mb/s connection is $39.95 and their top-level service is $149.95. You can check this community network map out to see if you live in a state with restrictive laws and what big broadband is near you. 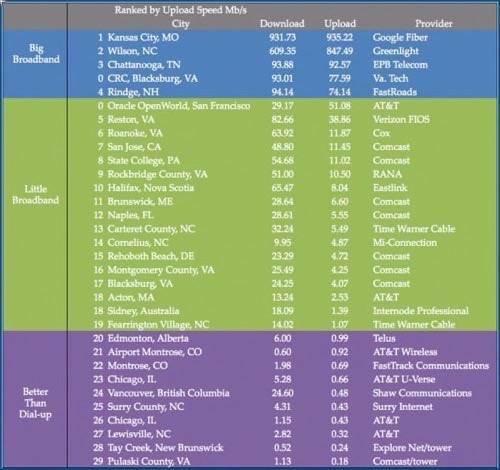 Or you can peruse this chart to see cities within the U.S. currently rank with broadband. Larger municipalities have not been as eager to embrace FTTH. One reason is they often have more large companies who can afford the cost of high-speed Internet access to city offices. There are no big cities on the list of fiber projects at this point and it will not be an easy matter to change this. Commentary on the issue spans the whole spectrum of opinions from Andrew Crane who really doesn’t think there is much of a problem to Susan Crawford who thinks quite the opposite. One way to think about the whole issue is to look at your bill for TV/cable/Internet. Using my new rate and projecting a 15% annual savings with a more competitive fiber network shows I could save $3,000 over ten years. I would also have Internet speeds and quality of service that I can only dream of today. There are 45 homes in our subdivision with similar cable bills so the potential for savings is substantial. Could savings such as this finance FTTH? It is possible, but only if service providers stop fighting progress.